We all get a bit of “Irish Luck” in SWTOR with both Double XP and Bounty Contract events lasting through this weekend. Don’t forget that all eligible subscribers will get a Lucky-77 speeder for free. Check your in-game mail and enjoy. 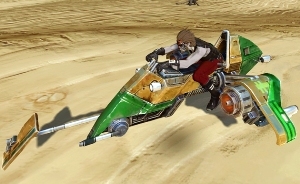 For more details be sure to read this post on the official SWTOR website.